FA: John Shewchuk, George Ridgley, August 2007. Excellent, sustained, and tightly-bolted route in a spectacular location. Climb one of the first tier routes to approach the ledge. 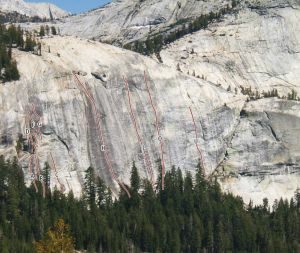 A single 70m allows lowering to the ledge, but it requires two 60m ropes to rappel the approach pitch. Which SuperTopo guidebooks include a topo for Tourette's?